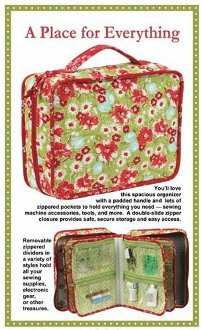 You’ll love thisw spacious organizer with lots of zippered pockets to hold everything you need — sewing machine feet and accessories, tools, and more. The case measures about 10"H x 13½" W x 4"D and features a handle at the top for easy carrying. A double-slide zipper closure provides safe, secure storage and easy access to all your supplies. Removable pocket pages with pocket arrangements in four styles feature zippered pockets to hold all your supplies, electronic gear, or other treasures. The clear vinyl pockets provide an easy view of everything in the bag. Mesh pockets on the inside of the front and back of the case provide storage space for a 9" x 12" cutting mat or ruler, book, or other items.